This is an old favourite we’ve not done in a while. It’s become known as the Blackberry Line in our house, in reference to the two main points of interest: it’s a disused train line which once served the port of Truro, and a good spot for blackberrying. Stories about the Blackberry Line used to be requested frequently, we imagined The Queen coming to visit the docks, the engine cleaning shed, blackberries splatting in people’s faces as the train whistled along the line. Our forays are not quite as eventful, but enjoyable nonetheless. It’s a two mile long path along the course of the old railway. It’s fairly level and flat and popular with cyclists, being part of the National Cycle Network (Route 3). The kids were on their bikes here for the first time today. It’s a good place to learn as there are lots of straight stretches, if a little stony. Our conversations were mainly about sewage and recycling as we passed the processing sites of both. We also took in this nearby geocache. We’ve walked the whole length of the trail in various stages. The walk from Gas Hill to the river at Calenick is a good one; it’s not too far and provides a place to stop and picnic and then return the same way. Probably just under two miles. 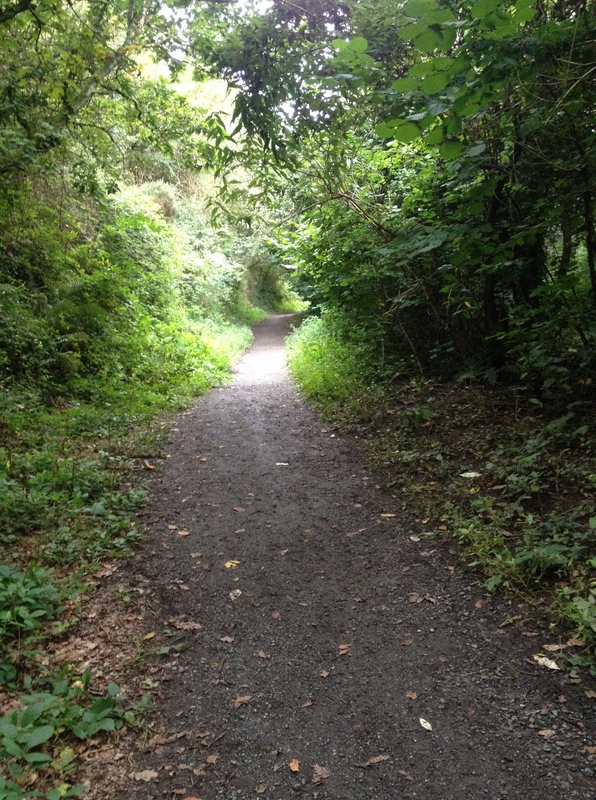 There’s a longer, circular walk here along the trail and through Truro City centre (4 miles). We look forward to doing this one day when the kids have more stamina. Parking: There is a car park at the start of the trail on Gas Hill on the Newham Industrial Estate. It’s often full during the week with people who work on the estate. You can also park on Gas Hill. Toilets: None on the trail itself. Cafe: Nope, unless you make it as far as Truro. Pushchair suitable? Yes, it can get muddy in places. Time: Depends how far you go. You don’t need many directions – just follow the trail. To take in Calenick, turn left when you pass through the first gate – onto Old Falmouth Road and follow the road down to the river. We did this one again on Sunday. More cycling practice with no stabilisers this time. More practice needed.